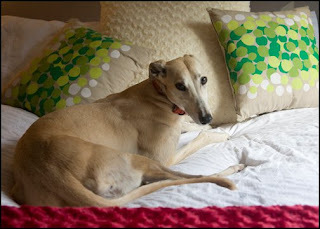 Nightrave greyhounds blog: Meet the Nightrave racing doggies! Meet the Nightrave racing doggies! Yesterday I went to visit our Nightrave racing girls, who are currently in the 'racing school' in Waikato. It was a very exciting experience - we have been planning to add racing dogs to our pack for a while now - and finally, it is happening! And I am Stella (All The Coco) ! Hannah looks like a dingo -complete with EARS! I took loads of pictures, however most turned out blurry - greyhound puppies are very energetic! I am always amazed how different young greyhounds are compared to a seasoned racing dog or a retired racer - they are like energizer bunnies, never standing still! Most of my photos turned out like this!! 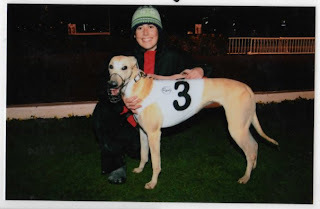 Felicity with Cate at the racing track in September 2009. Dad is Scotty (Scotexcited) - an amazing dog with a great personality, great looks, great racing career and a fantastic pedigree. 2nd 2007 NEW ZEALAND SHOOTOUT 527m Auckland. We'll bring you more updates from the racing pups as they grow up and get closer to beginning their careers. Fingers crossed! Wow! What a great looking dog! Seriously she is gorgeous!